Project Deliverables are the outputs of the Project Process. These are the end results of the Project Management Life-Cycle, delivered based on the promised milestones and schedules. Project Deliverables can be Project Management Deliverables or Product Deliverables. Results, Products or Services delivered in Project Development Life-cycle. Deliverables of a Project vary from the Project to Project based on the domain. For example, Application are the final deliverables in the Software Application Development Projects (in IT Domain), Products are the deliverables in the Manufacturing, buildings or constructions are final deliverables in real-estate. Deliverables in Projects can be Interim deliverables or final deliverables. Interim deliverables of Projects are outputs of the project development which are not yet finalized or accepted by customer. Developer provide the interim outputs to customers to make sure that the project development is going as expected. Client can have look and suggest if there are any deviation from the Project Specification. This will help both the developer and clients to achieve the final outcomes of the project on time. Final Deliverables of Projects are the end results provided as per the client specifications. These are the out puts which are tested and signed off from the Quality Control and Testing Teams in the Organizations. 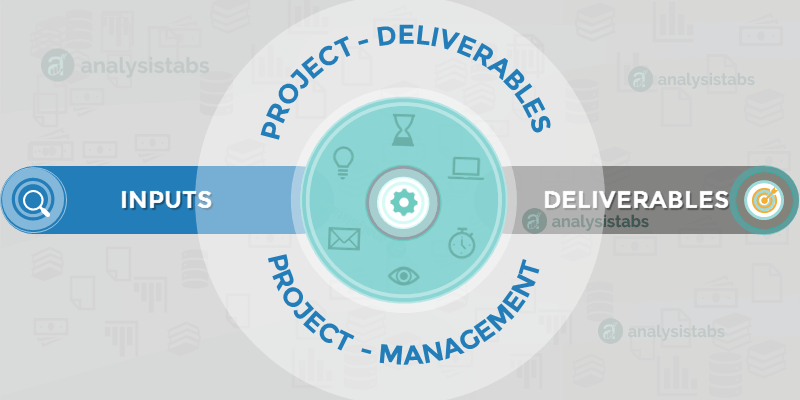 When do you define Project Deliverables? Project deliverables are listed while defining the Project Scope in Project Planning Time. Project Management team will prepare the list of the deliverables to meet the client specifications. Who decides the list of Project Deliverables? Project Client and Project Management Teams. Project development team creates the Project Milestones to deliver the project deliverables on scheduled timelines as per SLA. We Receive the Inputs, analyze the Inputs, and Process and produce the Deliverables. Here are the example inputs in Project Management Process for producing the Deliverables. Information: Project Background, Limitations and Project Specifications. Files: Project Details, Plans, Emails and other important files required for processing the Projects. References: Client may ask you to refer the previous project or specific project like the new assignment. It helps the development team to easily understand the project requirement. You may take some of the development or use the program in the new project. Applications: You may need specific applications or software to process and achieve the milestones. Tools: Special equipment and Tool may require for finishing some jobs. You can ask to the clients. Here the few example deliverables in Project Development Process. Other: Tools, Vehicles, Buildings, Construction, Services, etc. Project deliverables are the final outputs in the Project Management and Project Development Process. Project Deliverables are the results of the successful completions of Project Milestones. 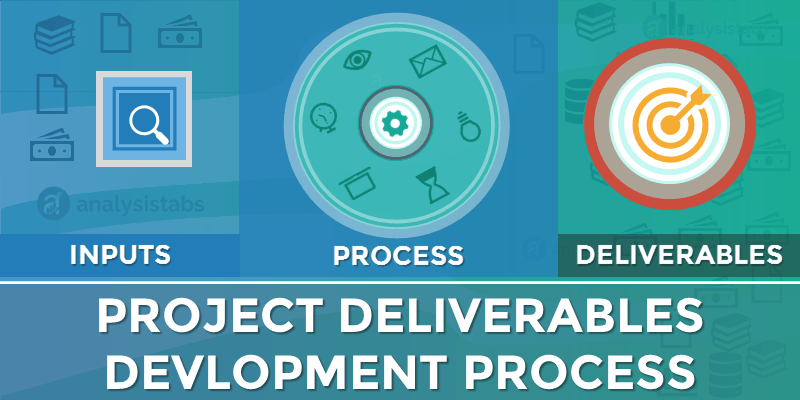 There are several steps and phases involved to generate a deliverable in Project Development Process. A separate process and milestone created to produce the deliverables. It involves Human Resource, Equipment, Tools, Budget and Participation Clients, Managers and Team Members. Here is the Process of Producing the Deliverables in Project Management. Understanding the Requirement: Project Development team must understand the Project Requirement, Project Background, Objectives and Budget. And decide and accept the Project based on the feasibility. Project Scope Statement: Prepare Project Scope and define the Project Deliverables to meet client specification. And sign off from the customer. Receiving the Project Inputs: Receive the Inputs and Analyze the Inputs. Check if all the information is okay and as per the agreement. Project Planning: Create the Project Plan with Milestones. Assign the Milestones and Tasks to the Resource. And share with the customer. Design Document: Prepare the design document and get the sign off from the customer. Develop: Start developing the Project and timely update project status to the customer. And make sure that the development is going on as per the Project Plan and timelines. Test: Test the outputs and provide to the customer for testing. Make the changes as per the customer feedback. 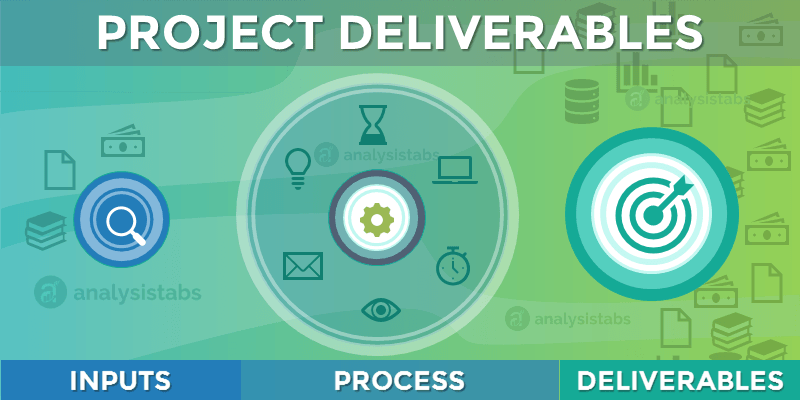 Deliver: Provide the final Project Deliverables as promised and planned. Checklist: Check if everything is delivered and close the project. Here is the list of Deliverables in Project Management, you can see the deliverables are different in each Project. Deliverables in IT / Software Field: Desktop Applications, Web Applications, Mobile Apps, Tools, Process, Consultation and Services. Deliverables in Construction Field: Buildings, Houses, Apartments, Flyovers, Bridges and Projects. Here are the list of Project Deliverable Template. You can download the templates and Prepare Project Deliverables Report. Project Deliverable Checklist helps you to make sure that you are delivering all the outputs as promised. Project Milestones are created to provide the Project Deliverables as per the client specification. Creating Milestones helps to achieve the results on time. Project Charter is created to specify the all aspects of the Projects. Project Deliverables are one of the important Elements in the Project Charter. We send the email to the client and list all the project deliverables in the email body. We can ask for the confirmation email, client will revert to the email by confirming that they have receive all the deliverables as promised.